Near the end of August, while deploying their newest wave buoy 3 miles offshore of Blind Pass, Marine Lab scientists dove into what is known as a “dead zone.” In this “dead zone,” there was no life. None at all. When diving at the spot Marine Lab Research Assistants A.J. Martignette and Jeff Siwicke are usually accompanied by schools of fish and bottom-dwelling invertebrates. This time it was different. The only fish they noticed were decomposing on the bottom. The crabs, sea stars and corals were dead and crunchy like an old roach under the refrigerator. Back at the surface they quickly formed a hypothesis. The persistent Red Tide had produced so much dead sea life that the decomposition of the dead matter was reducing oxygen levels at the bottom so much that most life was dying. A few days later a Marine Lab team returned to the area and surveyed along a 15-mile stretch from Redfish Pass to Lighthouse Point. They found that there was indeed a large area of anoxic (devoid of oxygen) bottom water that was 20 feet thick in places. In areas where the bottom water was devoid of oxygen, there was a denser layer of water which stratified at the bottom, sealing off mixing with more oxygen-rich surface water. Freshwater discharges from the Caloosahatchee and Lake Okeechobee can intensify stratification in the Gulf of Mexico when the less dense fresh water flows over the top of denser Gulf waters. Plans were made to do an additional survey to estimate the area of this dead zone. Tropical Storm Gordon came along and delayed the survey until three days after the storm had subsided. When the more intensive survey was undertaken after the storm, only a small area offshore of Redfish Pass was found to still be anoxic. The storm had provided needed mixing to transfer some oxygen to the bottom and the local dead zone had dissipated. Two weeks after Tropical Storm Gordon, a smaller survey showed a dead zone had returned to the area. A larger grid survey was then undertaken about three weeks after the storm, and we found the dead zone had returned. 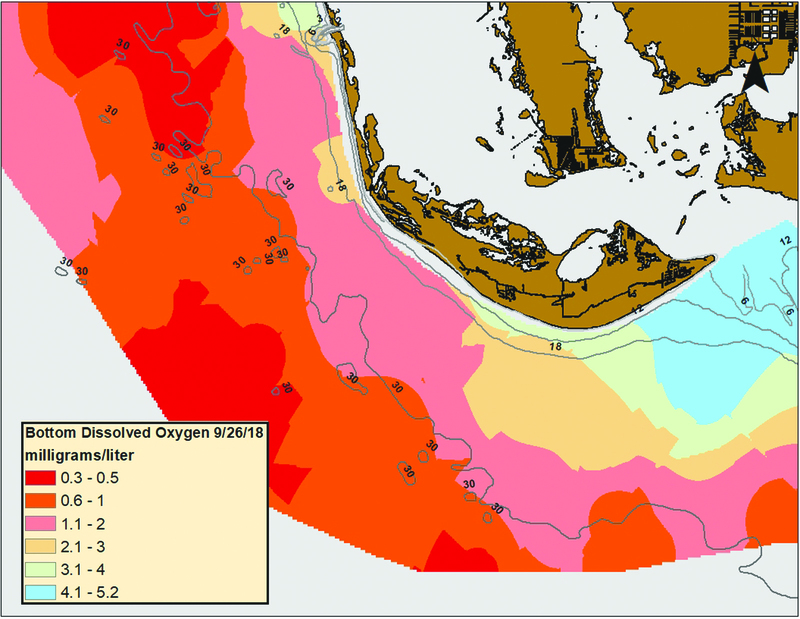 Sampling found that the dead zone now covered about 242 square miles in the vicinity of Sanibel and Captiva. The area surveyed was only a portion of the actual extent of the dead zone due to range limitations of our current research vessels. After Hurricane Michael passing through, we expect changes. The Lab is currently out in the Gulf doing a new survey of the dead zone. Michael may give us a break for a while. Dead zones in the Gulf of Mexico are well documented in the area adjacent to the Mississippi River discharge. Like a larger version of our coast’s freshwater discharge characteristics, the Northern Gulf of Mexico receives freshwater inputs from a basin which drains two-thirds of the entire United States, including its farm belt. As you can imagine – a lot of nitrogen and phosphorus flows down the Mississippi and is injected into the northern Gulf. This nutrient (nitrogen and phosphorus) input causes large phytoplankton (algae) blooms and the dying algae settles to the bottom and decomposes, causing depleted oxygen in the stratified waters. A task force was formed in the 1980s to study that dead zone and annual surveys showed that the size of that dead zone could be predicted from the amount of flow from the Mississippi in the spring and summer. In 2017 the size of the northern Gulf of Mexico was found to be 8,776 square miles – the size of New Jersey. There exist many similarities between the large watershed created by the connection of Lake Okeechobee to the Caloosahatchee, with its injection of nutrient-laden water into our local Gulf waters, and the Mississippi discharging mid-western farm and urban sprawl runoff into the northern Gulf. Both create large phytoplankton blooms which create large amounts of decomposing organic matter in a bottom layer of water. With less-dense freshwater (which also brings nutrients) flowing over those bottom layers, they become stratified and anoxic. The dead zone we are finding offshore of Sanibel can be attributed to the toxic Karenia brevis Red Tide organism. Red Tide kills fish and other creatures in the water column. These dead creatures then sink and oxygen levels at the bottom of the Gulf drop as their bodies decompose. Bottom dwelling organisms then die due to the lack of oxygen at the bottom. Due to these Red Tide and dead zone events, many questions have arisen which local folks have demanded answers to. Currently the Marine Lab is providing information to assess the extent of the damage. However, it will be up to each and every one living in this area, in this state, in this country, and on this planet to realize that the damage being seen in our waterbodies is a result of what we do in our backyards. We will never be able to sustainably “fix” these problems after they present themselves downstream; the “fix” must begin at the source -- us. Algae removal and treatment on the scale of the Red Tide and blue-green algae blooms seen in our area cannot be economically viable and the problems will only grow until each of us take actions in our backyards and change our habits. The amount of nutrients coming off our lands must be drastically diminished. To do this both the volume of water which runs off our land and the amount of nitrogen and phosphorus in that water must be reduced. Regulations such as Sanibel’s vegetation and fertilizer ordinances and its development codes reduce water runoff and nutrient concentrations. Yet more must be done. If we fertilize at all – it is contributing to the problem. Every space that doesn’t have vegetative cover allows too much water to run off. Please plant vegetation, shrubs and especially trees. Trees reduce runoff volume and nutrient concentrations more than almost anything we can do. The dead zone in the northern Gulf of Mexico has become a permanent feature there, eliminating a food supply and recreational area and devastating a New Jersey-sized wildlife habitat. They just live with it now. The similarities we have with the northern Gulf are many – we may be on the road to eliminating the benefits we derive from our portion of the Gulf of Mexico, too. The dead zone may become one of our area’s permanent features. Goldman Sachs Gives and the Vince family supported the collection of samples from the Dead Zone.